"Paul Revere (1735-1818) was an American silversmith and patriot in the American Revolution. He was born in Boston on January 1, 1735. He had descended from Huguenots, and was educated in his father's trade of goldsmith. In the French and Indian War he was at Fort Edward, on the upper Hudson, as a lieutenant in the artillery, and on his return he established himself as a goldsmith, and, without instruction, became a copper-plate engraver. He was one of four engravers in America when the Revolutionary War broke out. He was sent by the Sons Of Liberty, of Boston, to confer with their brethren in New York and Philadelphia. Early in 1775 the Provincial Congress sent him to Philadelphia to learn the art of making powder, and on his return he set up a mill. The president of the Congress, Joseph Warren, chose Revere to warn the people at Lexington and Concord of the expedition sent by General Gage (April 18, 1775), and to tell Adams and Hancock of their danger. He was made a prisoner while on his way from Lexington towards Concord, but was soon released. Longfellow made Revere's Midnight Ride the subject of his well known poem. He served in the military corps for the defense of his State, and after the war he cast church bells and cannon; and he founded copper-works at Canton, Massachusetts. He was the first in the United States to smelt copper and roll it into sheets. Revere's foundry manufactured the copper fittings for the frigate U. S. S. Constitution. In 1795, as grand master of the Masonic order, laid the corner stone of the Massachusetts State House at Boston. 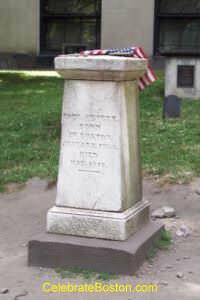 Paul Revere died on May 10, 1818. His house still stands in Boston's North End.